1. Environmental and genetic factors influencing stress reactivity. 1.1. Hypothalamic-pituitary-adrenal-axis in postnatal life (D.M. Vázquez, S. Levine). 1.2. Early-life environmental manipulations in rodents and primates: potential animal models in depression research (C.R. Pryce et al.). 1.3. Gene targeted animals with alterations in corticotropin pathways: new insights into allostatic control (S.C. Coste, S.E. Murray, M.P. Stenzel-Poore). 1.4. Rat strain differences in stress sensitivity (B.A. Ellenbroek, E.J. Geven, A.R. Cools). 1.5. Glucocorticoid hormones, individual differences, and behavioral and dopaminergic responses to psychostimulant drugs (M. Marinelli, P.V. Piazza Bordeaux). 1.6. Social hierarchy and stress (R.R. Sakai, K.L.K. Tamashiro). 2. Stress and the immune system. 2.1. Stress-induced hyperthermia (B. Olivier et al.). 2.2. Cytokine activation of the hypothalamo-pituitary-adrenal axis (A.J. Dunn). 2.3. Glucocorticoids and the immune response (G.J. Wiegers et al.). 2.4. The molecular basis of fever (T. Cartmell, D. Mitchell). 3. Stress and psychiatric disorders. 3.1. Animal models of post-traumatic stress disorder (I. Liberzon, S. Khan, E.A. Young). 3.2. Neuroendocrine aspects of PTSD (R. Yehuda). 3.3. Depression and effects of antidepressant drugs on the stress systems (S. Modell, F. Holsboer). 3.4. A contemporary appraisal of the role of stress in schizophrenia (R.R.J. Lewine). 3.5. Atypical antipsychotic drugs and stress (C.E. Marx et al.). 3.6. The role of stress in opiate and psychostimulant addiction: evidence from animal models (L. Lu, Y. Shaham). 3.7. Stress and drug abuse (R. Sinha). 3.8. Stress and dementia (E. Ferrari et al.). 4. Novel treatment and strategies targeting stress-related disorders. 4.1. CRG antagonists as novel treatment strategies for stress-related disorders (T. Steckler). 4.2. Non-peptide vasopressin V1b receptor antagonists (G. Griebel, C. Serradeil-Le Gal). 4.3. Substance P (NK1 receptor) antagonists (N.M.J. Rupniak). 4.4. Glucocorticoid antagonists and depression (J.S. Andrews). Subject Index. 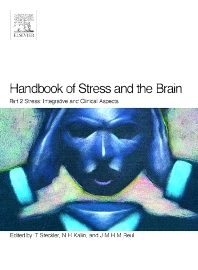 The Handbook of Stress and the Brain focuses on the impact of stressful events on the functioning of the central nervous system; how stress affects molecular and cellular processes in the brain, and in turn, how these brain processes determine our perception of and reactivity to, stressful challenges - acutely and in the long-run. Written for a broad scientific audience, the Handbook comprehensively reviews key principles and facts to provide a clear overview of the interdisciplinary field of stress. The work aims to bring together the disciplines of neurobiology, physiology, immunology, psychology and psychiatry, to provide a reference source for both the non-clinical and clinical expert, as well as serving as an introductory text for novices in this field of scientific inquiry. Part 2 treats the complexity of short-term and long-term regulation of stress responsivity, the role of stress in psychiatric disorders as based on both preclinical and clinical evidence, and the current status with regard to new therapeutic strategies targetting stress-related disorders. Researchers and clinicians in the fields of neuroscience, neurobiology, physiology, immunology, psychology, and psychiatry. University of Wisconsin Medical School, Department of Psychiatry and Health Emotions Research Institute, Madison, WI, U.S.A.
Henry Wellcome Laboratories for Integrative Neuroscience and Endocrinology, University of Bristol, U.K.